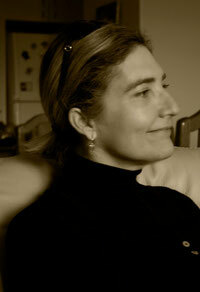 Michèle Meister was born 1966 in Lindau Germany and grew up in Lausanne in Switzerland and Uelzen, Germany. She studied Fine Arts at the Free International University Hamburg under Karin and Wolfgang Genoux, who were master students of Joseph Beuys. During this time Michèle was first inspired to produce her own colours from basic pigments, as this gave her more artistic freedom. After the completion of her studies in 1993, Michèle moved to Santorini, Greece, where she had spent her Sabbatical Year (1991) painting and studying the Akrotiri Frescos, dating back to 1600 BC. 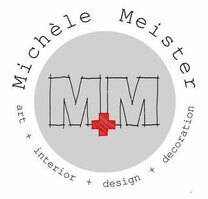 From 1993-1995 Michèle had several successful exhibitions in Hamburg and Santorini and in 1998 opened her own gallery “Gallery Kastelli” in Santorini, where she painted and taught art classes on the “freedom of art”. Many of her works produced during this period are now permanently exhibited in Santorini, and are also in private collections in New York, New Orleans, Athens, Berlin, Venice, London, Paris and Melbourne. In 2004 Michèle moved to Melbourne. It was this move which inspired her for her solo exhibition 'The Travel' at 69 Smith Street Gallery in 2008. ‘zwischen den zeilen - between the lines’ was her last sola exhibition at 69 Smith Street Gallery in 2010, about her latest body of work, where the line and the written word are major features in her large-scale drawings. Since 2005 she has been part of many group shows and few art prizes, like the Stanthorpe Art Festival in Queensland in 2010 . “By living with different languages, the language of painting has become most important for me because of it’s freedom and liberty,it’s explanation is not important... this would reduce the dimension of the painting to spoken language and would render the painting unnecessary. My paintings are not results but developmental milestones in the evolution of ‘The Painting’ that has yet to be painted.